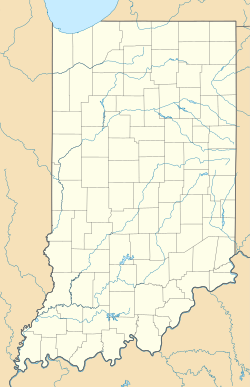 Snow Hill is an unincorporated community in Washington Township, Randolph County, in the U.S. state of Indiana. Snow Hill was first settled about 1838. An old variant name of the community was called Mount Pleasant. A post office was established at Snow Hill in 1856, and remained in operation until it was discontinued in 1907. Snow Hill is located at 40°05′31″N 84°57′47″W﻿ / ﻿40.09194°N 84.96306°W﻿ / 40.09194; -84.96306. ^ "US Board on Geographic Names". United States Geological Survey. October 25, 2007. Retrieved 2017-03-05. ^ "Snow Hill, Randolph County, Indiana". Geographic Names Information System. United States Geological Survey. Retrieved 2017-03-19. ^ Tucker, E. (1882). History of Randolph County, Indiana: With Illustrations and Biographical Sketches of Some of Its Prominent Men and Pioneers : to which are Appended Maps of Its Several Townships. A.L. Klingman. p. 134. ^ "USGS detail on Snow Hill - Variant Citation". Retrieved 2017-03-19. ^ "Randolph County". Jim Forte Postal History. Retrieved 1 November 2015. This Randolph County, Indiana location article is a stub. You can help Wikipedia by expanding it. This page was last edited on 19 May 2017, at 21:43 (UTC).